It’s been over two years since the series four finale of The Great British Sewing Bee graced our screens – and we think that’s two years too long! After its sister title, The Great British Bake Off moved from the BBC to Channel 4, everything went quieter than a broken sewing machine… Until April, when BBC2 officially announced that the show will be returning next year – much to the delight of Sew readers! Once again, a group of talented amateur stitchers will take on challenges over eight weeks and face the Sewing Bee‘s expert judges – fashion designer Esme Young and Community Clothing founder Patrick Grant. So, what do we know about the highly-anticipated series five? Award-winning comedian Joe Lycett, who has starred in a number of comedy and panel shows will be replacing the quick-witted Claudia Winkleman. Funny man Joe told the BBC: “My mum loves this show and she's bursting at the seams, she's sew excited! Weave talked about it and she says I'm tailor-made and I'll have the contestants in stitches.” If these jokes are anything to go by, we think Joe will make a very punny host! 2. Will Esme Young return for the Great British Sewing Bee 2019? Thanks to Joe's social media accounts, we know that judges Esme and Patrick met the comedian during his tour back in June. He captioned the hilarious pic: “Met the #SEWSQUAD for the first time at my show last night. Patrick and Esme are a riot! I can't wait to get working with them on Sewing Bee.” Which means both judges are definitely returning! To read more about what Patrick thinks of judging the show, head over to Craft Business. The Sew team were buzzing with excitement when we saw the series 5 trailer! The clip gives you a first glimpse of the tasks, tense stitching moments and sewing mishaps (admittedly, most of them were caused by Joe). To see for yourself, head over to @miss_esme_young on Instagram! The GBSB has produced some fantastic stars over the years, such as Tilly Walnes, Lauren Guthrie, Stuart Hillard, Heather Jacks and Charlotte Newland. We know what you're thinking: will The Great British Sewing Bee Live return? We're not sure, but we certainly hope so! 7. Who are the contestants on Great British Sewing Bee 2019? Are you ready to meet the stars that you're going to be rooting for over the next eight weeks? Of course you are! This year, the show sees six ladies and four gentlemen enter the sewing room - to find out more about their home towns, jobs and more, head over to BBC2. Drum roll, please! Now, for the moment that you've all been waiting for: when does it start? The Great British Sewing Bee will air on Tuesday 12th February on BBC2! We can barely contain our excitement, and we're sure you can't either! Get into the spirit of the Sewing Bee and enter your makes into our Dressmaker of the Year competition! Craft while watching the Sewing Bee with these top makes! Bee inspired by the show and subscribe to Sew magazine this month to be entered into a prize draw to win the Brother Innov-is A16 machine! 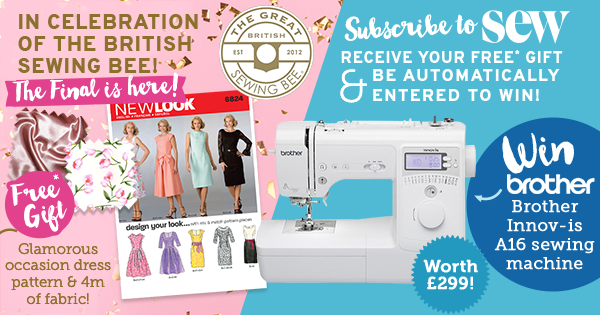 Plus, this week’s exclusive Sewing Bee subscription offer is a glamorous evening dress pattern from New Look and four metres of fabric!